This week’s Specimen of the Week is believed to come from an African bush elephant Loxodonta africana, known as the largest and heaviest land animal in the world. This heart would have had no light task as the muscle responsible for pumping blood throughout the body and providing it with oxygen and nutrients. Technically, the internal organs of an elephant are proportionately no bigger than those of other mammals. In this case, though, the heart makes up to a whopping 5% of an elephant’s mass. Depending on the elephant’s age, this means the heart weighs between 12 and 21 kg – the maximum weight of a carry-on or check-in suitcase respectively! In comparison, an adult human heart only weighs around 310 grams, and is the size of a clenched fist. How, then, to measure an elephant’s heart rate? Researchers in the 1930s – the first to attempt it – believed that an artery behind their ears would allow them to take the elephants’ pulse; alas they were never able to locate it. They had to resort to the electrocardiogram (ECG), which records the electrical signals produced by the heart every time it beats, through sensors attached to the skin. In general, small animals have higher heart rates – reportedly, canaries have a heart rate of over 1,000 beats per minute. Humans, by comparison, have a resting heart rate of 60-100 beats per minute (bpm). Elephants are on the lower end of the spectrum: their hearts beat only around 30 times a minute; their blood vessels are wide and can withstand high blood pressures. At the very end of that spectrum sits the blue whale, at 8 to 10 bpm. Most animals’ hearts slow down when they rest or sleep. The elephant is unique in that its heart rate actually speeds up when it is lying down – a fact that stumped early researchers. It has since been discovered that when an elephant lies down, the sheer weight of its body reduces its lung capacity and to compensate, both the heart rate and blood pressure increase. Animal soft tissues are often preserved in fluid. Walking around the Grant Museum, you may notice that these preparations have a crucial flaw: the specimens lose their colour and, to some extent, their shape. Our all-singing, all-dancing elephant heart, on the other hand, is an example of freeze-drying: a technique, pioneered by UCL curator Reg Harris in the 1940s and 1950s, where a specimen is frozen and the water is removed in a vacuum chamber. 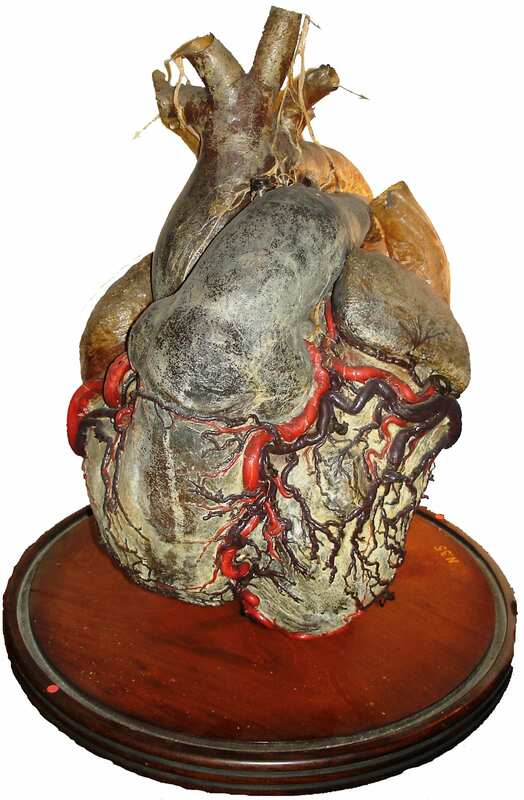 The heart is an especially well-preserved specimen, and the largest specimen Harris ever prepared. Benedict, F.D. & Lee, R.C., 1936. The Heart Rate of the Elephant. In: Proceedings of the American Philosophical Society 76/3, 335-341.